It's not often that one gets emails from the famous out of the blue, but I got a kind note from Jack Goldstone the other day. He had come across my earlier installment of thoughts on historical analogies between Trump and Hitler; he also pointed out that the differences I highlighted looked a lot less reassuring now. Below are my original points and his comments in blue. While Trump's rhetoric against Latinos is pretty amazing, he doesn't think of them as all-powerful puppet masters controlling the US today. Whatever went wrong in the US recently, according to Trump, is not directly driven by Latinos themselves; their presence is a symptom, not a cause of what he and his supporters think is a malaise In the Bannon world, the “global elites” take the place of the Jews. Like the Jews, the global elites are soulless, interested only in their personal wealth, and have no loyalty to any nation. They show this by carelessly admitting Muslims and other foreigners to undermine national cultures. No belief in "Lebensraum" -- there is no potty theory leading Trump to push for territorial expansion. But there is a theory of trade bargaining in which the U.S. has been whipped and taken advantage of and that “must be changed, now.” Exactly like Lebensraum – an injustice and stupidity against national rights that must be reversed. A conciliatory start. Hitler and friends did not begin their reign by trying to suddenly sound moderate and generous towards their internal opponents (though they did go easy in terms of foreign policy aggression until Germany was stronger militarily...) And his first week in office? 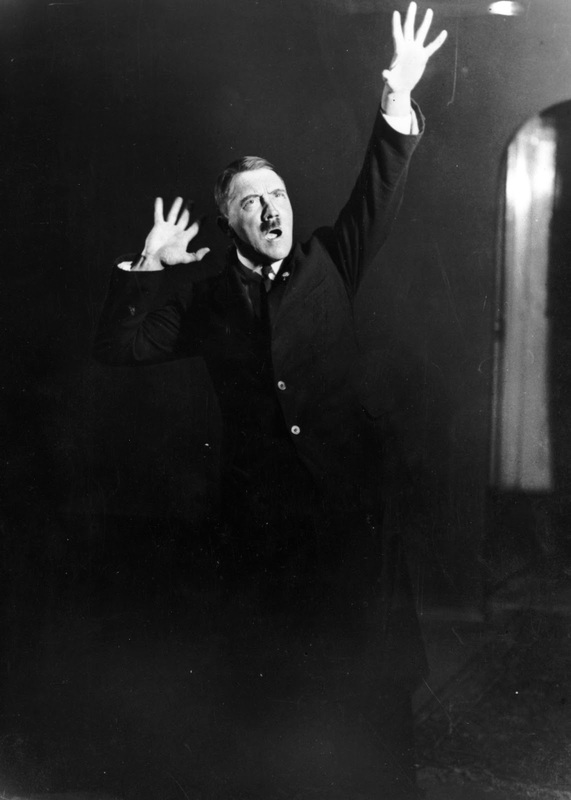 Hitler was very eloquent and a highly talented public speaker. Nobody can accuse Trump of either... But his skill on Twitter has, so far, been the equivalent of Hitler’s orations. Trump has managed to set the agenda, bypass media, and reach directly to his base by social media. The right-wing elite in Weimar supported Hitler (in the end); in the US, they mostly opposed Trump. We'll see where the opportunists jump once the inauguration has taken place. Weak-willed republicans and CEOs have mostly fallen into line, come to NY or Washington to kiss the ring. Few right-wing elites have spoken out against the insanity of Trump’s (1) willful lying about voter fraud; (2) plans for higher tariffs to fund the useless wall with Mexico; (3) efforts to design immigration policies to keep Muslims out and let Christians in from the Middle East. I would point to one important difference - the vigorous response of American civic society, and, to some extent, the judicial push-back. The wave of protests in recent weeks feels different from Weimar, where the social democrats, Communists and other democrats quickly gave up. First it was Trump; now it's Erdogan. Something "bad" happens in terms of future governance, in a democracy -- either the election of an egomaniac with autocratic tendencies or a constitutional powergrab by someone of that description. And a lot of economists believe that good institutions are good for growth and governance, me included (in some way). Now, in both cases, stock markets have reacted positively -- by a lot in the case of Trump, by a bit in the case of Turkey today. (BTW, the same thing happened in Turkey in 2010). There is also another case that I explored with Tom Ferguson a while ago, of a powergrab being associated with stock market increases (not that spectacular overall, but large for connected firms) -- valuation changes after Jan 1933. While this is just a bunch of cases and not a systematic analysis, there are at least some (pretty important) cases when markets seem to love the bad boys and bad news in terms of institutional quality. How to put these two things together is not entirely clear to me -- constraints on the executive have NOT gone up this morning, in Turkey; and while the verdict is not out on Trump's presidency, there is no sense in which the man has shown excessive deference for checks and balances, etc. In Jan 1933, it became pretty clear pretty quickly that things were not headed in the "inclusive institutions" direction. I was just handling a submission at the EJ. All 3 reports were in after 54 days. Two said r+r, one said accept with revisions. Accepted conditional on some changes. The referees were succinct and to the point, and while the paper was in some sense "competing" for some of them, they were open-minded and very fair. For once, I feel that I handled a paper the way I would like to -- more like my own experience at PNAS was, where the first round was approximately four weeks and the second, a week -- from submission to accept in five months or so, with most of that due to revisions. Some people say it cannot be done in economics, that the field is too amorphous and standards of excellence too heterogenous for that, but I don't agree. Research is a conversation, and I don't find it reasonable to ask authors to demonstrate that what they are saying/doing is the final truth... as long as it is important and well-done. We employ a unique dataset on members of an elite service club in Germany to investigate how elite networks affect the allocation of resources. Specifically, we investigate credit allocation decisions of banks to firms inside the network. Using a quasi-experimental research design, we document misallocation of bank credit inside the network, with state-owned banks engaging most actively in crony lending. The aggregate cost of credit misallocation amounts to 0.13 percent of annual GDP. Our findings, thus, resonate with existing theories of elite networks as rent extractive coalitions that stifle economic prosperity. The data underlying this is nothing short of amazing. I came across this because it connects with some recent work I have done on the dark side of social capital, but I think the measurement of misallocation method could be used in a wide variety of settings (not invented by Haselmann et al., as a matter of fact) -- if one could get the data. Related to this, a message by the strongman that combines nationalism, xenophobia, and a sense that one's own country has been headed in the wrong direction for some time. Let's make America great again? Deutschland erwache (Germany, wake up -- meaning a rebirth of Germany as a strong and proud nation once more). Your own country is amazing, ueber alles, but it has recently fallen into an abyss. And part of what has gone wrong is that the wrong people have been let in -- Jews in the case of Germany, Latinos in the case of the US. Voters who are more enthused about "teaching a lesson" than what the candidate they voted for actually stands for. Germans in 1932 didn't go through a checklist of policy items that the Nazis supported, from war to genocide, and liking every point, ticked the box for the Führer; they mostly had enough of austerity, misery, the politics of gridlock and seeming ineffectiveness of democratic leaders. Related to this, a surprising willingness to tolerate crassness and a complete lack of tact and etiquette from the leader in question... If you had told me that anyone can insult women the way Trump did, on the record, and have ANY chance to be elected, I would have laughed six months ago. The Hitler movement, of course, outdid any of this in terms of public declarations about what they would do once in power, what to think of their opponents, etc. A democracy where significant parts of the population have given up on central elements of their constitution - not quite the "democracy without democrats" that historians write about in the case of Weimar, but one in which one of the oldest democracies on earth is basically governed by people (who were in turn elected by many of the people) who think the constitution is a joke, checks and balances are for woozies and elected representatives on average deserve no respect. A center-left elite that largely fails to take the threat seriously. German newspapers in late December 1932 were congratulating themselves that the Nazi menace was receding, and that Hitler would never become Chancellor. Enter the "big data" political forecaster-quacks here, and an elite discourse that underestimated Trump from the first day of his candidacy until the 8th of November. No aftermath of military defeat that affected voting intentions and everyday politics, as did WW I and reparations. No hyperinflation that destroyed a good part of the wealth of the middle class (ht/ Laurence Copeland). 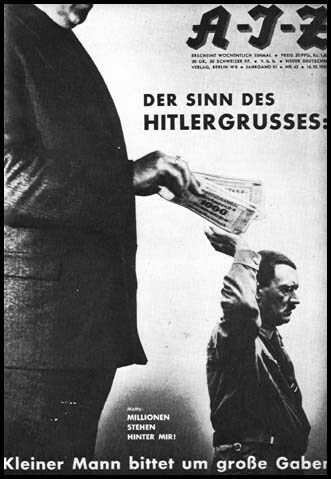 No business empire to take care of in the case of Hitler; while he liked money and rewarded the tax inspector who left him alone over unpaid income tax for "Mein Kampf", there was no secondary business agenda there that might interfere with political aims. So what does it all mean? Some kind of autocracy is coming. Something somewhere between Putin and Berlusconi, if we are lucky; something worse if we are unlucky. The thing that gets me the most is the almost pathological unwillingness on the left to believe what the candidate has been saying... Hitler's program was available in print, and Donald Trump is not an empty slate that deserves "an open mind". Both have an agenda, and unbelievable, even unimaginable as they seemed just shortly before, they both probably mean every word. In the face of a political elite that is fast flip-flopping to the winning side, a spineless media, and a large silent majority of people who don't give a fig about their democracy, I don't put too much trust in institutions, the checks and balances of the US constitution, or civic society stopping even the worst excesses. How bad could this get? Gratuitous wars in, say, the Middle East (Iran), the Far East (Korea), or Latin America (Cuba)? Possible, but perhaps not that likely. The professional input from the Pentagon will limit what can happen, to some extent -- but as we saw with GWB, only to some extent. Protectionism? It's a wild card; if Trump is energetic and focused, the US withdraws from the WTO and repeals NAFTA, this can start to look amazingly ugly quite quickly. A brutal rift within NATO that de facto abandons the Baltic Republics to a resurgent Russia? Not likely, but suddenly a possibility. Deportation of illegal immigrants and the wall? Don't rule that out at all; deportations rates have varied a lot, and were actually up under Obama; there is something awkward about tolerating a large number of people who are breaking the law in one's country, and while the social consequences of suddenly righting this are very ugly, there are many fascets to this argument. A lot of pressure on the media to fall into line? For sure. And a Supreme Court that can roll back decades of social progress, down to Roe vs Wade; very likely. Hugely expanded powers for snooping and incarcerating people suspected of terrorism, including US citizens; again, quite likely. An attack on affirmative action and the like? Possible. All of this is suddenly within reach as possibly acceptable policies, and the greatest hope is that "they don't mean it" and that implementation will not be very vigorous. I hope I am wrong, but to me it looks like the world in four years time will not look like a place you imagined possible 6 months ago.